I recently was asked by a friend to shoot a "Talking head" 30 second commercial for his run at a seat in city government. It all happened inside of 24 hours. I shot it on an EX1R in 1080/24p and then I remembered it was for TV so reshot in 1080/30p. When I got the Comcast specs later and looked at my options in FCP 7 and Compressor, I couldn't tell if my 24p footage slapped onto an XDCAM EX 30p timeline would have sufficed. It was a one shot do or die submit by Noon situation so I played it safe and used the 30p footage/timeline. Attached is the Comcast Spec sheet. I had to guess here and use the Compressor ProRes preset but couldn't correlate "Upper Field FIrst" to the Compressor choices of Odd/Even so I flipped a coin and used the deinterlacing (Odd) filter to get 1080i. 1) Did I guess right? 2) Is there in fact a way to use the XDCAM EX 1080/24p footage? Think of it this way -- would they not run a movie because it had been originally shot in 24p? So of course you can shoot 24p - you just need to output it in 1080i or 720p for them to accept it. I'm not seeing a 1080i preset in Compressor. What is there is to apply a Deinterlace filter choosing Odd or Even. Is that the right method? Which filter setting equals Comcast compliant "Upper Field First"? The option for Interlaced is under Frame Controls, third "divider" from the left. Turn on frame controls first. @Shaun: Thank you for the clear answer. Exporting it that way solved aliasing that showed up using the Compressor Filter. Rats! Next question, am I reading the spec correctly that I could have delivered the XDCAM EX right from the timeline if I had shot it 1080i, 720p or 1080p interlaced in my NLE and exported? 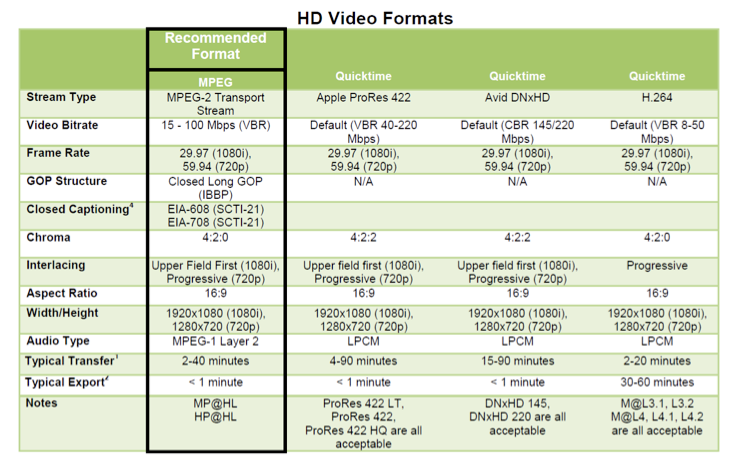 Looks to me that if you had shot 1080i or 720p you could have output directly to one of their acceptable formats (such as prores or dnxhd). 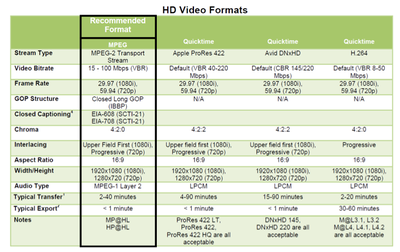 1080p is progressive, so unless you're talking about 1080 PSF your 1080p will not be interlaced. Thanks Dave. Since XDCAM EX is MPEG-2, I thought it might be what was in column #1. But wrappers matter and thanks to Shaun, I can get to a good looking ProRes 1080i from my 1080p. Thanks all.